Looking for a tasty take on brunch this weekend? 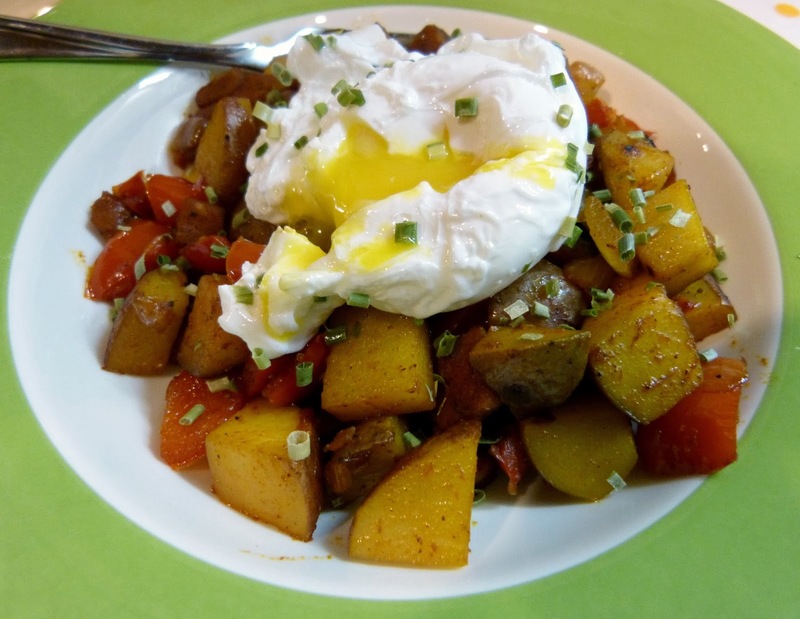 I recently made this chorizo, pepper, and potato hash with poached eggs for dinner (because my husband loves a good brinner), but it would make an excellent brunch too! I had a few leftover Usinger's chorizo links that I needed to use up recently and thought they would be delicious incorporated into a hash. 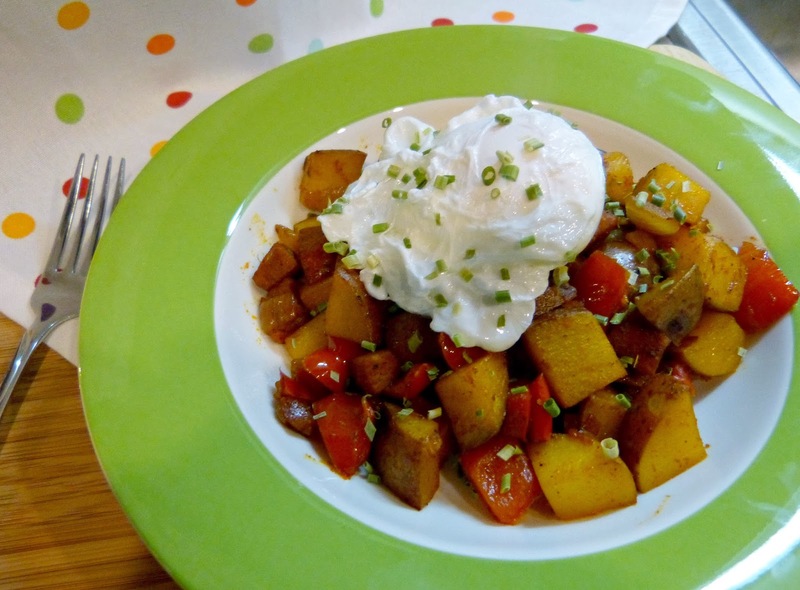 A potato hash is so versatile-- you can transform it into a completely different meal every time you make one just by altering the veggies and spices you add into it. Since I was using Spanish-style chorizo I decided to incorporate some flavorful paprika and sweet red bell peppers with a little cayenne for heat into this hash. If you have smoked paprika on hand, I highly recommend using that because the flavor is just amazing. However, if you only have traditional paprika that will work just fine too. Topped with a soft poached egg-- a runny yolk is key-- this is a perfect one dish meal. In a large skillet, heat oil over medium-high heat. Add chorizo to the pan and cook for 4-5 minutes until browned, stirring occasionally. Add onion, garlic, bell peppers, and potatoes to the pan and stir to combine. Reduce heat to medium and cook for about 10 minutes, stirring occasionally, until vegetables begin to soften. Stir in in paprika, cayenne, and season with salt and pepper. Continue cooking for another 20-25 minutes until potatoes are browned and soft. *Sometimes the potatoes start to dry up over this process and then they stick to the pan. If you encounter that, drizzle a little chicken stock in to moisten the mixture and stir through as needed. Once the potatoes are close to being cooked through, crack each egg into a separate small bowl (like a ramekin), being sure not to break the yolks. Fill a saute pan 3/4 of the way full with water and bring to a boil. Add vinegar and reduce heat to a simmer. Carefully drop the eggs into the water one by one (leaving a good amount of space between each ). Cook for 4-5 minutes until the whites are set and gently remove from the pan with a slotted spoon. Drain water from the eggs. Fill a shallow bowl with the warm hash and top with a poached egg. Serve immediately. Today's restaurant roundup is dedicated to one of America's favorite foods: the burger. Burger Bar is one of my favorite places to eat in the North/Clybourne shopping area of Lincoln Park. I generally consider this area to be a bit of a restaurant desert, so when we're up here and doing some shopping we make a point of stopping in at Burger Bar. Burger Bar has an excellent selection of craft beers and an even better selection of creative burger combinations. There is most definitely something for everyone on the menu here. It's one of the few restaurants that we go to regularly and I don't order the same thing every time-- there are just too many good options! They have tons of options here: an elk burger, a shrimp burger, and a bison burger that I love called the Wild Bill. It's topped with arugula, goat cheese, and tomato chutney all on a pretzel roll. That's pretty much all of my favorite items inside of a pretzel bun. And it's good. This time around, I went a little lighter and ordered one of their "Alt Burgers": A light and crunchy grain-based veggie burger served with arugula, goat cheese (noticing a pattern here? ), avocado, tomato, chipotle mayo. I don't often order a veggie burger, but I was craving something a bit lighter for lunch that day and it was exactly what I wanted. I don't know that we have ever had anything bad here. The mac and cheese is rich and delicious, the fried pickles are amazing, and the sweet potato fries are my go to side. They are super crispy and tossed in a little cinnamon and sugar. I love them! Rockit Burger Bar is the Wrigleyville-based burger focused sister spot to River North's always busy Rockit Bar & Grill. I have been here a handful of times before, but this was my first time since Rockit has gone full burger bar and I was pleasantly surprised. Normally you get overpriced drinks and mediocre bar food in the Wrigleyville neighborhood, but we actually had a really great dinner here. Rockit serves a variety of burger options: from the traditional to the inventive (like their ridiculous Mac Attack-- a burger with fried mac and cheese patties in place of buns) and from vegetarian to all beef, they have an option for every burger lover out there. Alex ordered The Farmhouse burger, which was piled so high with pulled pork, bacon, and a fried egg that he had to eat it with a fork and knife... but he sure did enjoy it! I went for the Johnny Appleseed burger with a turkey patty. The burger a really generous size and super moist-- especially for a turkey burger. And the toppings were so delicious! Neuske's bacon, diced apples, melty brie cheese, and a really tasty pecan aioli were all piled on top (another fork and knife-worthy burger) and this burger was served with Billy Dec's signature sweet potato fries. I didn't even have to order them! Although, I still would have... Like Burger Bar, this sweet potato fries were tossed in cinnamon and sugar for a perfect touch of sweetness. a laidback date night, drinks and snacks with friends, or a pre-Wrigleyville party meal. Last, but not least, is a restaurant that I have already told you a little bit about: 25 Degrees. The fanciest of the 3 burger bars I am featuring here, 25 Degrees has a trendier River North vibe versus the more laidback atmospheres of the other two northside restaurants. It's still a burger bar, so we aren't talking white tablecloths, but the restaurant is dimly lit with chic bordello-inspired decor so it feels a little more bar and less burger bar. That said, the burgers here are fantastic. 25 Degrees has four burgers that they've created on the menu in addition to a variety of interesting items available a la carte to create your own burger. Normally I take the a la carte route in a situation like this, but burger #2 looked so good that I didn't even feel the need to create my own! This burger was served with roasted tomatoes, burrata, crispy prosciutto, and pesto on a soft brioche bun. I did edit it slightly by adding sweet caramelized onions and subbing in a turkey burger, but wow, was it good! The burgers are huge and juicy and all of the ingredients are good quality so no matter how you customize yours, it will be really tasty. Alex went with BBQ sauce, jalapeno bacon, a fried egg, and habanero jack on his spicy burger. Sides are all served a la carte here as well, which makes them perfect for serving. The fries are good, but the onion rings are definitely my favorite-- they're coated in a delicious crispy batter with generously cut rings of sweet onion inside. 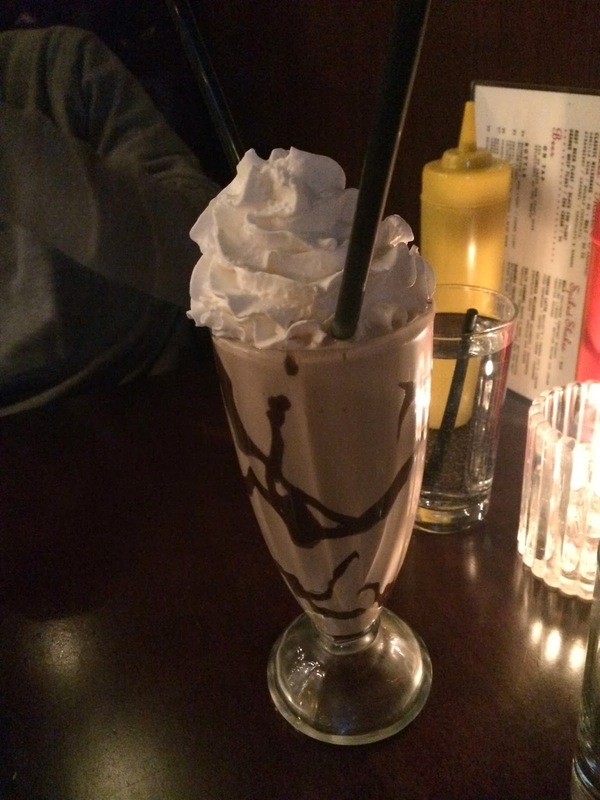 And don't forget a spiked milkshake! Alex and I split one of these ice cream cocktails for dessert and it was kind of amazing. They have a variety of flavor combinations available, but we went with the Night Owl: a combination of Trader Vic's, Godiva Dark Chocolate Liqueur, and chocolate ice cream. It was really rich, chocolatey, and the perfect sweet way to end our meal. P.S. 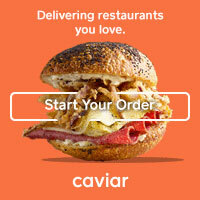 Have you checked out my new Restaurant Guide page yet? 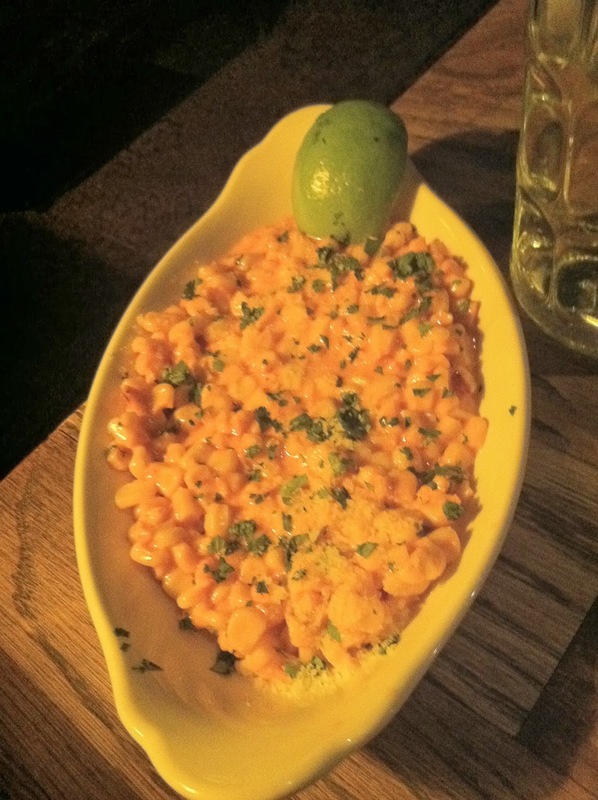 Find all of my Chicago restaurant posts and reviews arranged here by neighborhood and cuisine for your convenience! 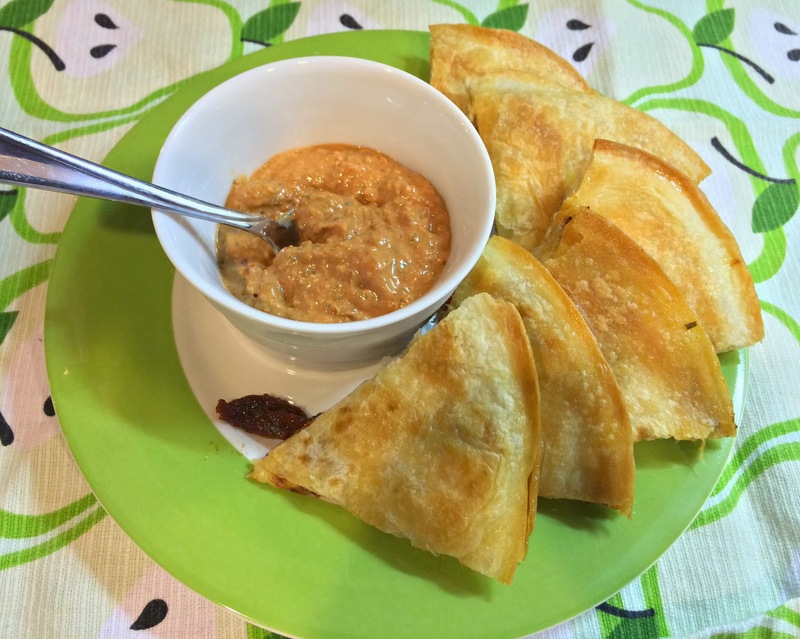 Looking for another easy recipe to serve to your hungry Super Bowl party guests? 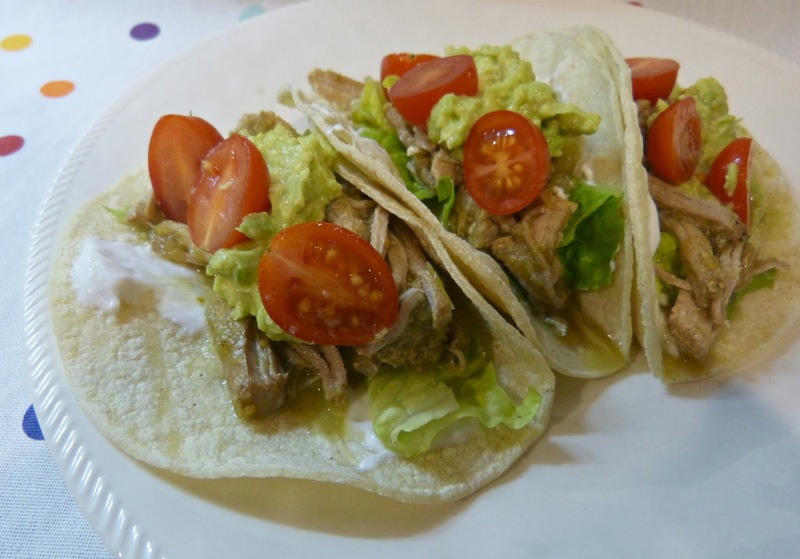 Look no further than these salsa verde pork tacos! The combo of tangy and spicy jarred salsa verde along with fresh onions and jalapenos give the pork a really unique flavor. Slow cooking it for several hours makes it perfect for shredding and serving in tortillas. This recipe could not be easier and is perfect for your party: Only a handful of ingredients, very little prep work, and they all go right into your slow cooker to cook all day. And that's all you have to do! Set up a bar of taco toppings and let your guests assemble their own. Done and done! Heat oil in a large skillet over medium-high heat. Season pork with salt and pepper and add to pan. Sear pork on all sides until browned and add to a slow cooker. Add onion, peppers, and salsa to the slow cooker and cook on low, stirring occasionally, for 8 hours. Remove pork from slow cooker and shred with forks. Add back to the slow cooker and combine with the remaining sauce. 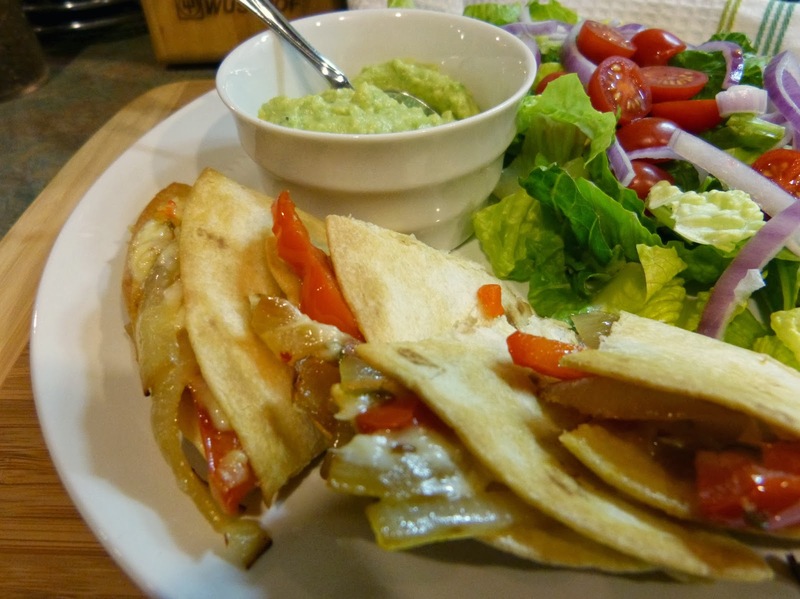 Keep warm until ready to serve in tortillas with your favorite taco toppings. Recently, the nice people over at Red Gold invited me to a Lasagna Party. This sounded like my kind of party, so of course, I was in! Red Gold is one of my go to brands for canned tomatoes-- which I use in so many different recipes. They have been around for more than 70 years and are based right here in the Midwest, so the majority of their produce is locally grown in Ohio, Michigan, and Indiana. I am sucker for local products-- especially high quality ones like Red Gold. They were generous enough to send me my very own Lasagna Party Kit (filled with all of the non-perishable lasagna essentials) so that I could host my very own party! Also included in the kit was a recipe for Red Gold's foolproof All-In-One Lasagna. 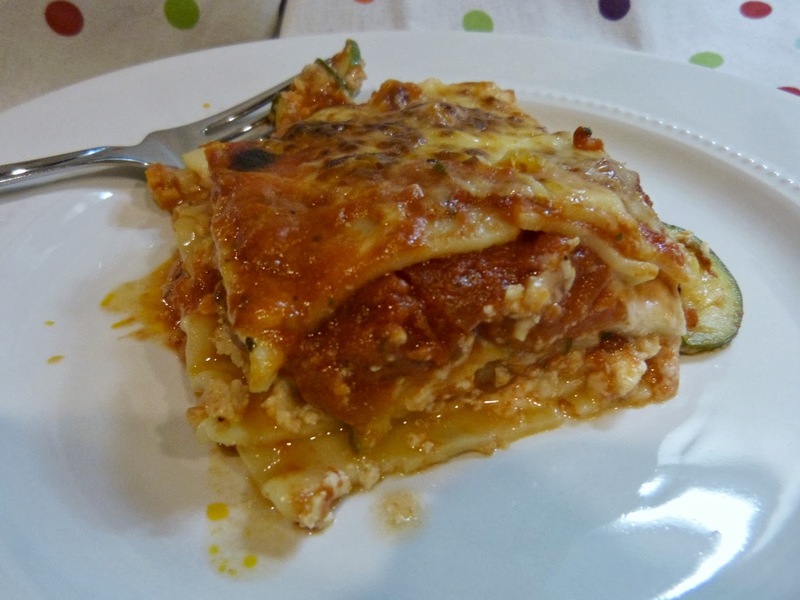 Knowing that lasagna can be a bit intimidating to make, they created a recipe that is super easy to follow and makes a perfect lasagna-- or the perfect base for creating a gourmet lasagna that is all your own! 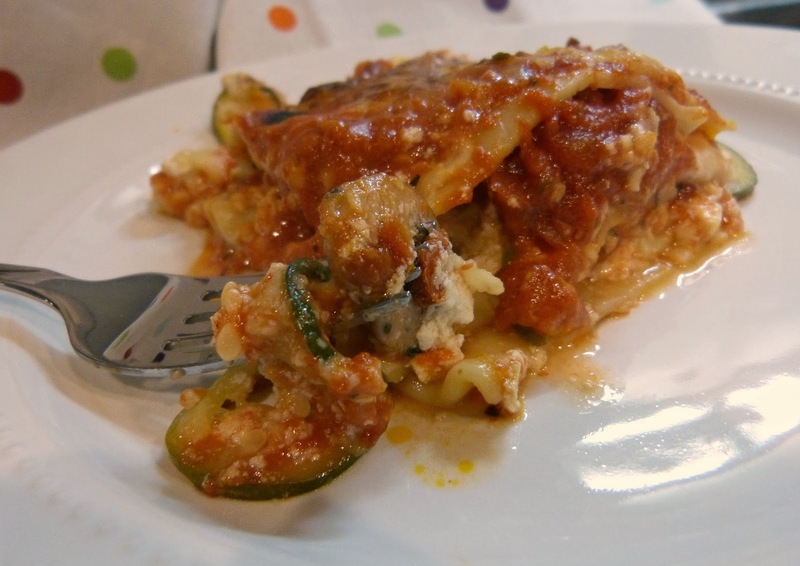 Red Gold has already come up with some fabulous recipes for simple gourmet lasagnas that involve just a few tweaks to the basic All-in-One recipe like Chicken Parmesan Lasagna, Eggplant Florentine Lasagna, and Fresh Harvest Lasagna. 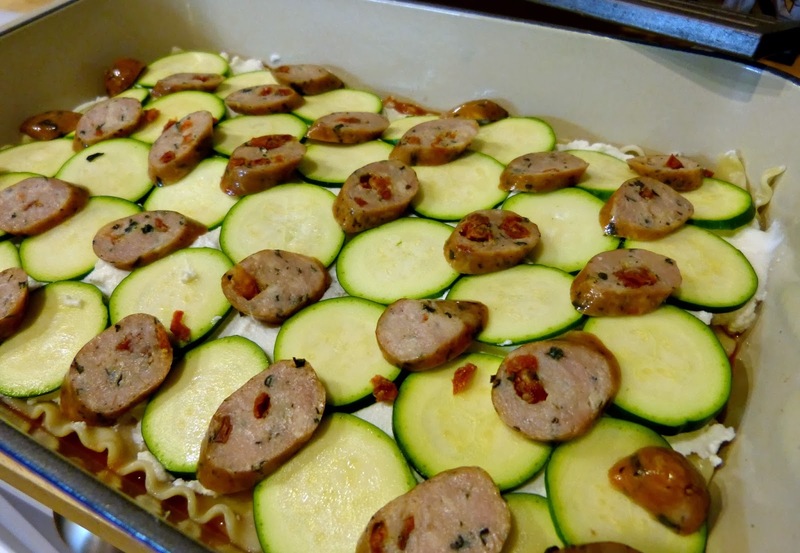 Never one to turn down a cooking challenge, I decided to use Red Gold's All-In-One recipe as a base for my very own lasagna: Zesty Italian Chicken Sausage & Zucchini Lasagna. I decided to spice up the sauce a little with some crushed red pepper flakes. 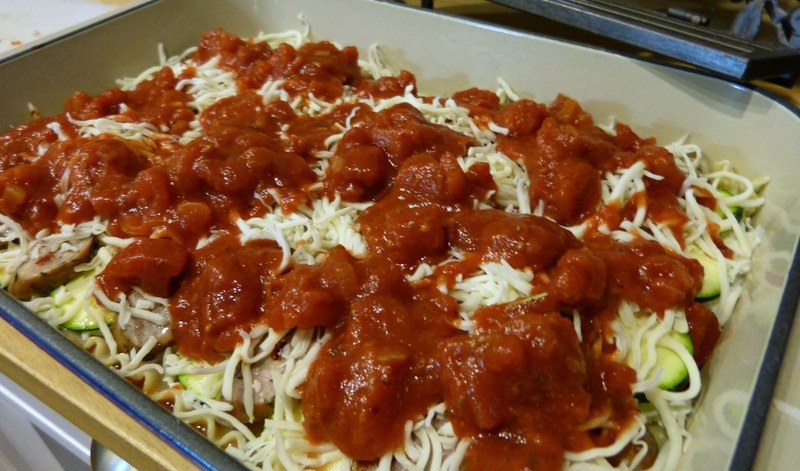 To the layers of pasta, cheese, and sauce, I added super thinly sliced zucchini rounds and some Italian chicken sausage. It was the perfect way to shake up a traditional lasagna, adding great flavors, some heat, and even a little bit of nutrition, without a ton of additional work. 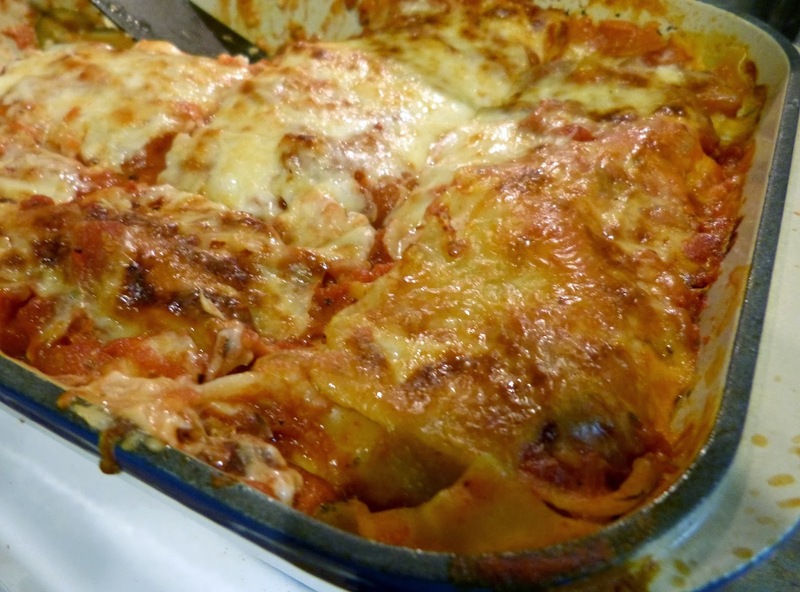 My Lasagna Party guests loved the results-- and I was pretty pleased with them myself! Want to join the Lasagna Party? Check out Red Gold's Facebook page (for a chance to win a fun lasagna party pack of your own!) and create your own Red Gold lasagna and post it online with the hashtag #RGLasagna. Preheat oven to 350º F. In large mixing bowl combine water, RED GOLD® CRUSHED TOMATOES, RED GOLD® DICED TOMATOES with BASIL, GARLIC & OREGANO, Italian seasoning, red pepper flakes, and salt. Cover the bottom of a 9x13x2-inch baking pan with 1½ cups of sauce mixture. Arrange 1/3 of noodles on top of sauce, slightly overlapped. 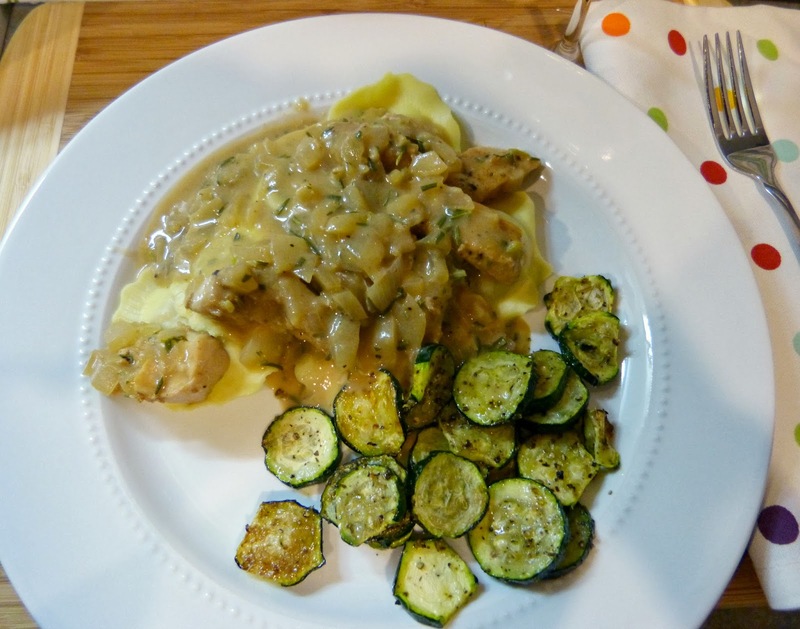 Top with ½ of ricotta cheese, ½ of the zucchini slices, ½ of the chicken sausage slices, 1 cup of mozzarella cheese and 1 cup of sauce. Repeat layers and top with last 1/3 of noodles and the remaining sauce. Sprinkle with remaining mozzarella and Parmesan cheese. The recipe makes 12 servings, but you could divide the recipe into two 9x9-inch baking dishes and freeze for a future dinner. Editor's Note: Some of the products here were provided to me at no cost by Red Gold. The opinions expressed here, as always, are my own. Thanks, Red Gold! I love using my slow cooker in the winter. When it is frigid outside and the days get dark so early, coming home to a dinner that is pretty much complete-- and also, very hearty-- is a great feeling. It's the little things, right? 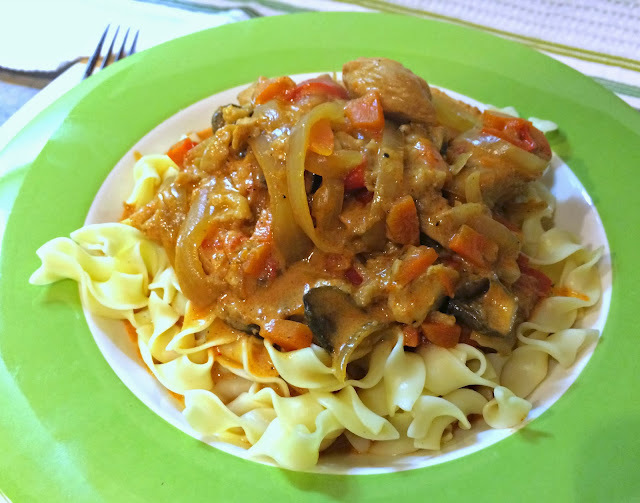 This slow cooker chicken paprikash is one of my favorite winter comfort foods. 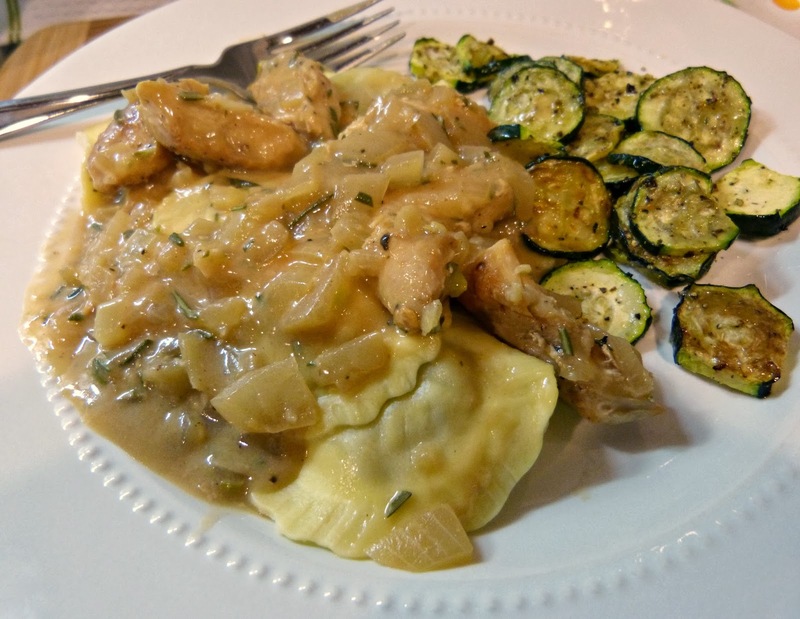 I'm part Hungarian so my mom frequently made this for us as kids and I also got to try the real thing on a trip to Budapest in college, so I have been tweaking my own recipe for it ever since. If you're not familiar with a paprikash, it is a classic and delicious Hungarian dish that consists of a thick sour cream-based sauce flavored with paprika. It usually includes chicken (which is how I have made it here and prefer it), but some people prepare it with beef or pork too. In many cases, you will see this made strictly with meat in the paprikash sauce. I like to load my slow cooker version up with vegetables like onions, red peppers, carrots, and mushrooms so that-- egg noodles aside-- this is basically a one pot meal. In a medium bowl, stir together flour and chicken strips until chicken is adequately coated. Heat oil in a large nonstick skillet. Add coated chicken strips and cook until chicken is lightly browned, about 4 minutes on both sides. Add chicken strips, onion, and next 11 ingredients (through cremini mushrooms) to the slow cooker. Cover and cook on low for 6 hours. Once the chicken mixture is cooked, stir in sour cream until fully blended-- The sauce will be a pale orange-pink color. Cook uncovered on high for an additional 30 minutes to allow sauce to thicken. Serve hot over cooked egg noodles. 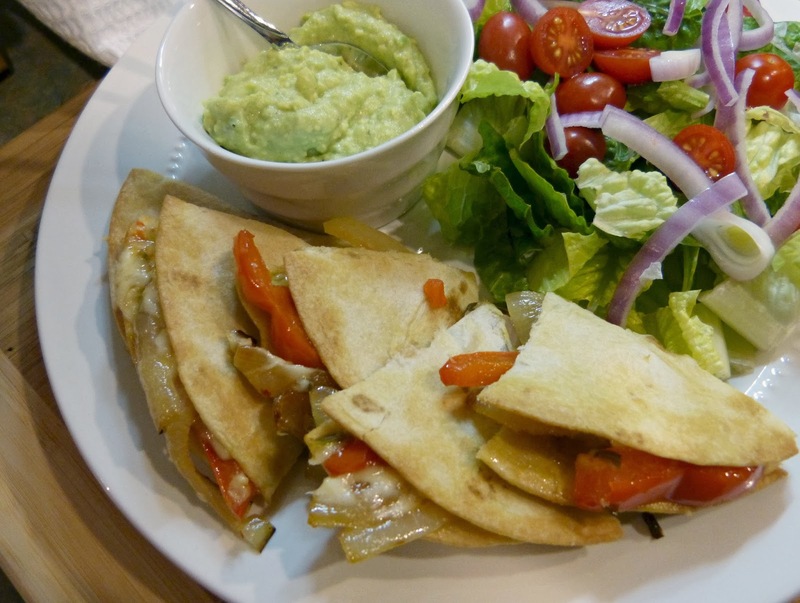 Derived from original recipe by Cooking Light.